CSM Christopher “Hammer” McKeown enlisted in the United States Army in April 1983. He received his Basic Training and his first phase of Advanced Individual Training (AIT) at Fort Jackson, South Carolina followed by phase two at Fort Sam Houston, Texas graduating from the Academy of Health and Sciences as a Nutrition Care Specialist and was assigned to the US Army Medical Corp.
During his active duty service, Command Sergeant Major McKeown was stationed with the 4th Combat Support Hospital and US Army MEDDAC from October 1983 to January 1985 at Fort McClellan, Alabama. In January 1985 was reassigned overseas to the 121st EVAC Hospital in Seoul, Korea and served till May 1986. 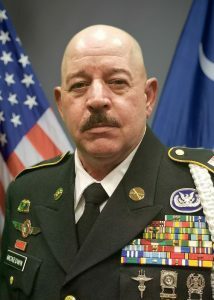 In July 1986 Command Sergeant Major was reassigned to the 46th Combat Support Hospital at Fort Devens, Massachusetts and served till January 1990. In January 1990 Command Sergeant McKeown was reassigned to oversee the reactivation of the 12th Mobile Army Surgical Hospital (MASH) in Wiesbaden, Germany. In September 1990 Command Sergeant Major McKeown was assigned to oversee the logistics of transforming the 12th MASH into the 12th EVAC Hospital in both equipment and personnel and be ready for deployment by November 1990 in support for Desert Shield. In December 1990 Command Sergeant Major McKeown deployed to the Middle East for Operation Desert Shield which later became Operation Desert Storm. In May 1991 Command Sergeant Major McKeown returned to Wiesbaden, Germany and served out his tour of active duty till April 1993. In March 2013, CSM McKeown joined the South Carolina State Guard and took on the position as First Sergeant in Delta Company / 2nd Battalion/ 2nd Brigade. In March 2017, he was reassigned to the Command Sergeant Major position for 2nd Battalion / 2nd Brigade and was promoted to Sergeant Major in July 2017. In October 2017 CSM McKeown was assigned as Command Sergeant Major for 2nd BDE / SCSG. In July 2018 due to restructuring CSM McKeown was assigned Command Sergeant Major to 2nd Battalion/ 1st Civil Support Brigade. 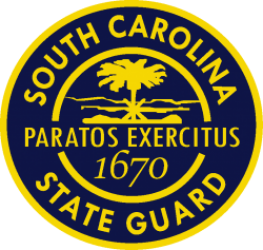 In August 2018, Command Sergeant Major McKeown was assigned the additional duties and responsibilities as NCOIC for the South Carolina State Guard Honor Guard Team. CSM McKeown’s civilian experience include Meat Cutting, Restaurant and Business Management and Farming. After Active Military Service CSM McKeown became a Certified Dietary Manager (CDM) and worked in several locations in South Carolina and took over operations for the Family Farm. In 1998 CSM McKeown started McKeown’s Heating and Air Services which specialized in HVAC in the Modular and Mobile Home Industry. In 2001 he took McKeown’s Heating and Air Service into a full Residential HVAC Company which is still in operation today. Command Sergeant Major McKeown’s awards and decorations include the US Army Commendation Medal w/ 2OLC, US ARMY Achievement Medal w/ Silver OLC, National Defense Medal, US Army Good Conduct Medal w/ 3 OLC, Southwest Asia Service Medal w/ 3 Bronze Stars, Korea Defense Service Medal, Kuwait Liberation Medal – Saudi Arabia, Kuwait Liberation Medal – Kuwait, Kingdom of Laos Order of the Million Elephants and the White Parasol Knight Medal, NCO Professional Development Ribbon w/ Number 2, US Army Service Ribbon, SCSG Commendation Medal, SCSG Individual Achievement Ribbon w/ OLC, SCSG Humanitarian Service Ribbon w/ OLC, SCSG Federal Service School Ribbon, SCSG Emergency Service Training Ribbon, SCSG Honors Detail Service Ribbon w/ OLC, Volunteer Service Ribbon w/ Gold OLC, SCSG Recruiting Achievement Ribbon, SCSG Good Conduct Ribbon, SCSG Service Ribbon, SCSG Military Proficiency Ribbon, SCSG Military Readiness Ribbon, Royal Lao Army Airborne Wings, German Army Air Borne Wings, Poland Army Airborne Wings, RAIDER Trident, Kingdom of Laos Jungle Warfare Badge, US Army Mechanics and Driver Badge, Military Emergency Management Specialist (MEMS) Badge with Flash. CSM McKeown’s SCSG training includes MP Course, CERT Instructor Course, Senior Leadership Course, Sergeant Major Course, Honor Guard School, Basic Defensive Tactics Instructor Course, Combat Life Saver Course.